Is this a chicken farm website? No, this is not a chicken farm site, or a foodie site, or a farm fresh egg site. I am not going to teach you how to raise chickens, cook chickens or harvest their eggs. So, what is this website? This is the new home of the Shoer Brisk family history sharing site. So, what's with the name? 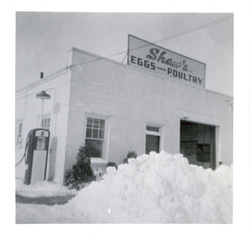 Shaw's Eggs and Poultry was the name of the Shoer family chicken and egg business, which operated in Salem, Massachusetts. Because the business employed many different family members over the years, the Shoer Brisk descendants (or at least the loudest ones) have taken on the chicken as the family mascot. It felt fitting to name this website after the family business, which features so frequently in our family lore. So, what's with the website? If you have found Shaw's Eggs and Poultry, hopefully you are not disappointed at the lack of real poultry information and are interested in the story of the Shoer family in America. I created this site to share the information I have found through my genealogical research and to gather and share the stories that continue to be told whenever Shoers gather. So, what do I do next? You can start by exploring the migration of the family from Russia to Michigan and to Massachusetts by clicking on the links above. Next, click on the Blog link to read the Shaw's Eggs and Poultry blog. To view the photos, please fill out the contact form at right to request to be invited to the Shaw's Eggs and Poultry Shutterfly page. So, how can I get involved? Just like Shaw's Eggs and Poultry the first, I want this to be a family business. It started with chickens, but it continues with you...your family branch, your family photos and memorabilia and your family stories. No one can tell them better than you. If you don't tell your stories, who will? Send me an email if you have an idea for the website, want to write a blog post, have pictures or memorabilia to share, or just want to let me know what you think. Use the form at right, or email me at jshoer [at] jenalygen [dot] com. Thanks for visiting and hope you will join the new family business! Send me an email and join the new family business.